After you create your design, you can print it on paper to test it, then print it on the CD or DVD that contains your data, photos, video, or music. Make sure the disc is loaded for printing before you start. Make sure your product is selected as the Printer setting. To see how your design will look without printing on the disc, click Test Print and follow the instructions on the screen. Note: If printing a test design on a sheet of paper, make sure that the CD/DVD tray is not inserted in the product and the CD/DVD feed tray is closed. 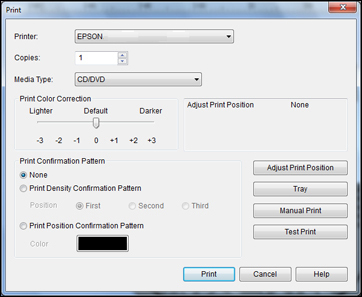 When you are ready to print on the disc, click the Print button on the screen.